I am going to take a different turn with my blog this week. I was reading the newspaper this weekend and was struck by an article. There was a young boy, Miles, who was diagnosed with leukemia when he was 18 months old. Now at the ripe old age of 5, and in remission, he was given an incredible gift by the “ Make-A-Wish Foundation ”. Do you know what his wish was? This 5-year old was asked; if you could be anyone, go anywhere, do anything or meet anyone; what would you want? He wanted to be superhero. He wanted to be someone who saved other people. WOW this child, presented with the option of getting almost anything he wanted, chose to be someone who helped others. Being the parent of a child who lost her battle to leukemia and who also had a wish granted by this amazing organization. Realizes first-hand what these children go through, endure and sometimes overcome. My daughter, who lost her battle to leukemia at 13, fought a good fight for 2 years. Never once did she ask why me, or did she say it’s not fair. She looked at each day as a gift and touched more lives in her 13-years than I could ever hope to touch in my lifetime. She, along with little 5-year old Miles are my heroes. We face challenges of all kinds every day. Those challenges can range from finding affordable housing, sustainable employment, finishing or starting our education, and how to pay for it. These children are faced with the ultimate challenge of life and death, and they embrace it. They get up and face every day as if it were their last. They feel weak but they want to play, they experience pain we can’t imagine but they still smile, laugh and continue to move forward. I know what you’re thinking, what does this have to do with my job search? How is this going to help me? It’s actually quite simple, you can’t give up. No matter what you face, no matter how hard it seems, when you just don’t think you can face it for one more day. That is when you have to dig deep within yourself and find the last bit of strength and plow forward. If you think you can’t move forward, if you think you can’t achieve the outcome you want. You’re right! The minute you make the decision you can’t do it, you won’t. The minute you decide it’s too hard, you’re done. The people who succeed in this world, truly succeed are those that never gave up. They never assumed that their dreams/ideas were too big or too hard. When the challenges surmounted they looked deep within themselves to find the strength and courage to continue on. Just like little Miles. Here is the other part that so many people don’t realize. The world loves a hero. They love a success story. They want to stand behind someone who faces down seemingly insurmountable challenges with a courage that is almost superhuman. The point is, when you face down your challenges, whatever they are, people will be there to support you, cheer you on, and help you find a way to make your dreams come true. I read a quote and forgive me I’m not sure where it came from. 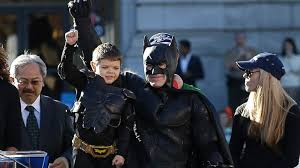 “Greatness is coded deep inside each of us if we dare to look for it.” Miles got to be Batkid for the city of San Francisco. He spent the day foiling crimes, rescuing damsels and saving the city. Riding alongside Batman in a black Lamborghini, receiving the keys to the city from the Mayor and being a hero. Over 7,000 people took part in granting his wish. Yes I said 7,000! “At one point organizers struggled to keep a path open for the motorcade, which drove past onlookers lining the streets six deep for several blocks”, according to the associated press. There are resources available to help you, if you look for them. There are people who will help you, if you let them. There are people who will cheer you on to success. Sometimes the very best thing we can do is simply, not give up. Miles, thank you for allowing us to participate in your wish. Thank you for reminding us of the importance of never giving up, not matter what the obstacle. Thank you for showing us that at the end of the struggle are rewards and opportunities better than we could ever have imagined. Fired Up? You Should Be! 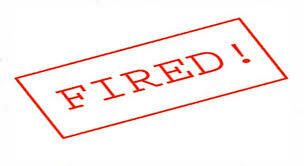 If hard skills get you hired, what gets you fired? I’m sure everyone has heard from some source recently that soft skills are lacking in their job candidates. So I was late a few times, what’s the big deal? Yes I use my cell phone at work, that’s my personal business not theirs. They won’t let me check Facebook at work. They don’t like my language, but everyone uses bad words these days. Yes these are real examples. Add these to the list of entitlement issues prevalent in our culture and we have a real problem. A mentor told me that once you are labeled as; clown, lazy, foul mouthed, distracted, unreliable, unmotivated or entitled, it will take a very long time and a ton of effort to change that perception. This is so true! It took me all of 6-months (probably less) to be labeled as a ball-buster that’s difficult to work with, and around 18-months (or longer in some cases) to repair and rebuild that perception. Not to mention an uncounted amount of home baked goodies. But it was completely worth it. Take ownership of your own behavior. Take inventory of what others say about you professionally, how are you perceived? Then dig in, dig out and make a difference. That is how you keep a job.